1. Cook pasta until just firm to the bite, approximately 8 minutes. Drain well and rinse with cold water. Place on a large oval dish. Add arugula and mix. 2. In a small skillet sprayed with vegetable oil, add corn and tomatoes and sauté on a high heat just until both vegetables begins to brown, about three minutes. 3. To make the dressing: combine mayonnaise, sour cream, ketchup and water and mix into pasta. 4. 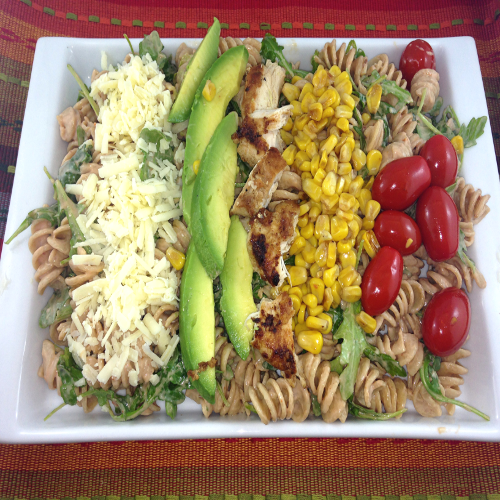 Place each corn, tomatoes, chicken, avocado and shredded cheese over top in separate rows to create the classic Cobb look.